At the International Association Electrical Inspectors Southern Section’s 2011 annual meeting it was my pleasure and honor to present the prestigious Gold Roadrunner Award to Chuck Mello and to Mark Ode, with the assistance of John Minick and Mark Earley, the two most recent recipients’ of this award. Photo 1. Chuck Mello and Mark Ode were inducted into the Roadrunner Club. 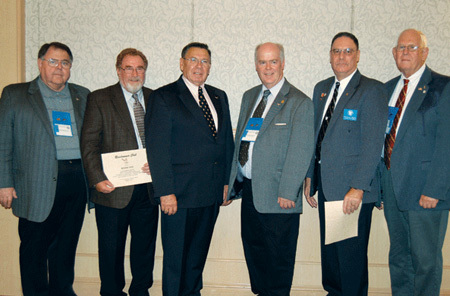 Left to right, John Minick, Mark Ode, Richard Loyd, Mark Earley, Chuck Mello and James Carpenter. Both Chuck Mello and Mark Ode have for more than 30 years participated in the education and development of the National Electrical Code (NEC) and the International Association of Electrical Inspectors (IAEI). 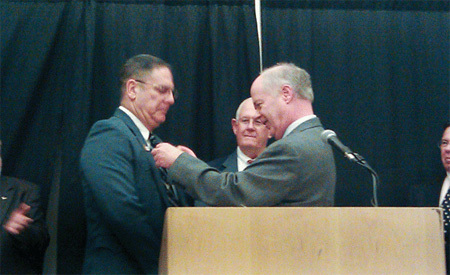 Charles F. “Chuck” Mello, international president IAEI and program manager, Field Evaluations, for Underwriters Laboratories, received the Gold Roadrunner pin. Chuck is a 34-year member of IAEI and has been an exemplary participant in the educational process at IAEI meetings and has attended all six annual IAEI regional section meetings for eleven consecutive years. He is a member of NFPA NEC Code-Making Panel 5, responsible for grounding and bonding. Mark C. Ode, lead engineering instructor for Underwriters Laboratories University, received his 35-year IAEI membership certificate at this meeting. Mark has attended and participated in IAEI meetings throughout the U.S. He has served on numerous code panels and presently serves on NFPA NEC Code-Making Panels 3 and 13, and is on the NEC Technical Correlating Committee. Mark is presently the lead instructor for Worldwide Internal Training for UL employees and UL customers. Photo 2. Chuck Mello, International President of IAEI, receives the Gold Roadrunner award presented by 2009 recipient Mark Earley, NFPA, at the 2011 Southern Section meeting in Chattanooga, Tennessee. The Gold Roadrunner Award is an honor bestowed by peers. It was first given out on or about October 1, 1968, at the Southern Section Meeting of IAEI. M.S. “Dude” Parmley, president of the Southern Section, and co-hosts, Jay Traylor and Sidney Wolfenson decided to honor the expert code panel members (dubbed circuit-riders) with a Gold Roadrunner pin to distinguish them from all the rest. The criteria to become a member of this very prestigious group were attendance at all IAEI section meetings for a minimum of five years and service on one or more NEC panels. The first ten men received their pins at the Houston, Texas, Southern Section Meeting in 1968. Over the years, an additional twenty code experts have received this award. The rules of membership have been revised and now a recipient must support and participate in the educational programs at IAEI Section meetings and other electrical meetings, contribute to the development and adoption of the NEC®, and make a significant contribution to the electrical industry as a whole. Nominations for membership are made by the existing members of the Gold Roadrunners club, and recipients are required to receive unanimous approval of the other roadrunner awardees. Photo 3. John Minick inducts Mark Ode into the Roadrunner Club. Mello and Ode bring the total membership of this elite group to sixteen living members. James Carpenter, retired; Alan Manche, director, Industry Standards, Schneider Electric/ Square D; John Minick, NEMA; Mark Earley, NFPA; Philip H. Cox, retired, consulting and teaching for IAEI; James T. Pauley, vice-president of Industry Standards, Square D Company; Philip Simmons, Simmons Electrical Services, NACMA; D.J. 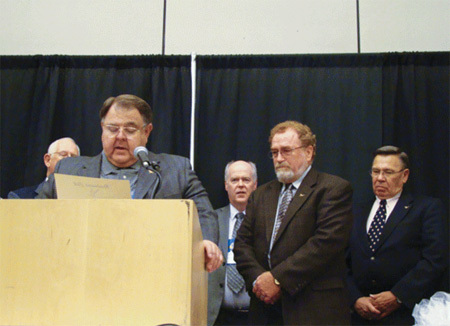 Clements, retired; Richard E. Loyd, Steel Tube Institute; Charles Forsberg, retired; Earl Roberts, retired; Wilford I. Bill Summers, retired; Jack Wells, Pass & Seymour Inc.; and Len Sessler, who is last of the original ten. Mr. Sessler is retired and makes his home in North Carolina with his wife. In September 1992, at the Southern Section Meeting, M.S. “Dude” Parmley requested the Roadrunners take responsibility of managing the organization from the Texas Gulf Coast Chapter. Dude stated he felt it was the right time to turn it over to the Roadrunner members. He and Richard L. “double L” Lloyd then asked Richard E. “single L” Loyd and his wife Nancy to over see the organization and see to it that it continued and pins be awarded. Next articleElectrical Interlocks with a Building Fire Alarm System — Are we consistent on this subject?